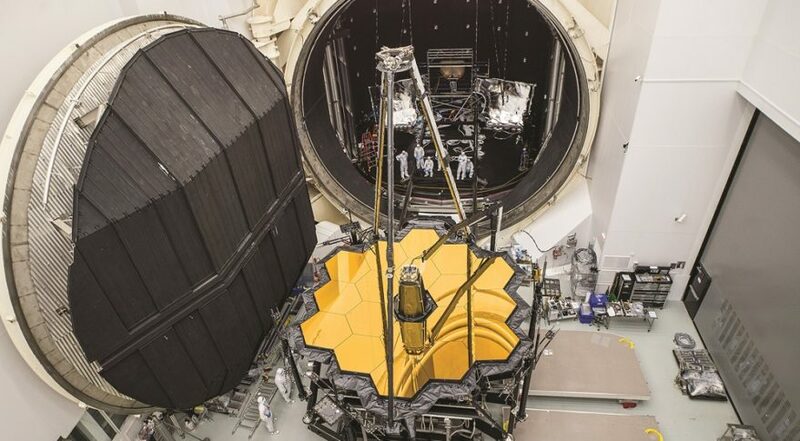 WASHINGTON — As NASA prepares for a key hearing later this week on the status of the James Webb Space Telescope, an agency official says that the mission’s delays will require nearly half a billion dollars that could come from cuts in other science programs. In a presentation to NASA’s Astrophysics Advisory Committee July 23 here, Paul Hertz, director of NASA’s astrophysics division, said the key period where NASA will need funding to accommodate JWST’s delays will be fiscal years 2020 and 2021, when the mission will still be in development rather than in operation, as previously planned. The 29-month delay in the mission’s launch, from October 2018 to March 2021, incurs about $1 billion in additional costs, he noted. Of that, $200 million is covered by existing project reserves, resulting in a net increase in development cost for the mission of $800 million. No changes are currently planned for the agency’s fiscal year 2019 budget request, which sought $304.6 million for JWST. Both the House and Senate versions of appropriations bills funding NASA, which have yet to be passed, provide that full amount. The key years, Hertz said, become fiscal years 2020 and 2021, when NASA previously expected JWST to be in operation rather that still completing development. NASA had planned to spend a total of $310 million on JWST operations in those years, funding that will instead be spent on development. “So we need an extra $490 million for Webb in FY 2020 and ’21 above what had previously been budgeted,” he said. Where that money will come from, he acknowledged, will be “a challenge.” While Congress could provide additional funding to cover that shortfall, he suggested the agency was preparing for the possibility of cutting funding to other projects, both within the astrophysics program and elsewhere, to cover the cost increase. “Accommodating this is likely to impact other parts of the astrophysics budget and possibly beyond astrophysics,” he said. He didn’t identify specific programs that could face cuts in 2020 or 2021, but did note several areas would be protected, such as research and analysis grant funding to scientists and the Explorer program of small astrophysics missions. “We will make sure that we fly decadal survey priorities as we make these decisions,” he added, which would appear to protect missions like the Wide-Field Infrared Survey Telescope (WFIRST), the highest priority large mission in the 2010 astrophysics decadal survey. WFIRST was targeted for cancellation by the administration’s 2019 budget request but has seen its finding at least partially restored in House and Senate spending bills. Those comments come as both NASA and JWST’s prime contractor, Northrop Grumman, prepare for an unusual two-part hearing this week about the mission by the House Science Committee. NASA Administrator Jim Bridenstine and Tom Young, who chaired the independent review board that examined the status of JWST earlier this year, are scheduled to testify before the committee July 25. Young and Wes Bush, chairman and chief executive of Northrop Grumman, will testify in the second part of the hearing July 26. Later in the advisory committee meeting, Eric Smith, the program science for JWST at NASA, emphasized the progress that the mission was making despite the latest delays and other issues, such as fasteners on the spacecraft’s sunshield membrane cover that came off during acoustics testing in April. Hertz assured committee members that, despite this latest delay, JWST should still be able to launch on an Ariane 5 that the European Space Agency will provide in exchange for a share of observing time on the telescope. That became an issue with this latest delay as the Ariane 5 will be phased out in the early 2020s in favor of the next-generation Ariane 6. “ESA has told us that there’s no problem with the Ariane 5 being available in the March 2021 timeframe,” Hertz said. But what would happen, a committee member asked, if there were further delays? “We’re not planning further delays,” Hertz responded.